That’s what the authors of Core Assessment and Training explain in this excerpt reprinted here with permission of the publisher, Human Kinetics. The tensor fasciae latae (TFL) muscle arises from the upper anterior portion of the pelvis, and it inserts into the iliotibial band (ITB). 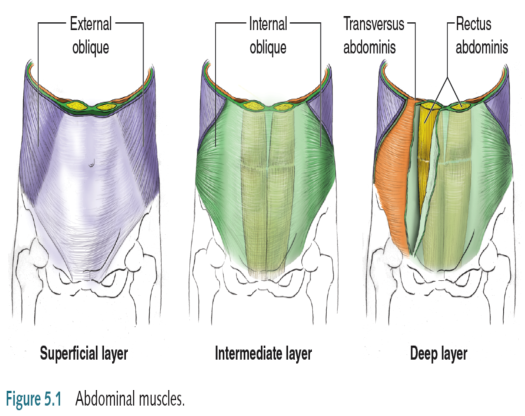 The ITB is a tendinous structure extending from the gluteus maximus and the tensor fasciae latae. The ITB inserts at the fibular head, the lateral patellar retinaculum, and Gerdy’s tubercle on the lateral aspect of the tibia (Paluska 2005; Messier et al. 1995). 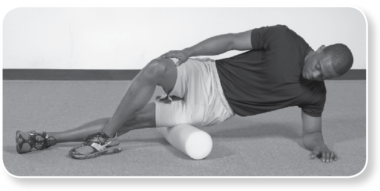 Pain in this lateral region is common for certain types of athletes such as distance runners. Why are recovery runs important? What’s the point of recovery runs? Why not rest to allow your body to recover? The author of “The Runner’s Edge” answers these questions in a podcast republished here with permission of Human Kenetics. Click on the article title to hear the podcast. Yes, there is more to running than simply going to the road and starting. Over the years, you’ll be able to run faster, more efficient, and with less injury by having better form. 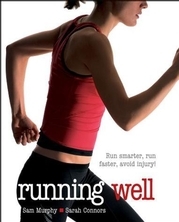 Here’s an excerpt from Running Anatomy that will help. It’s published with permission of Human Kinetics. Other than with strength training, how can running form and performance be improved? Because running has a neuromuscular component, running form can be improved through form drills that coordinate the movements of the involved anatomy. The drills, developed by coach Gerard Mach in the 1950s, are simple to perform and cause little impact stress to the body. 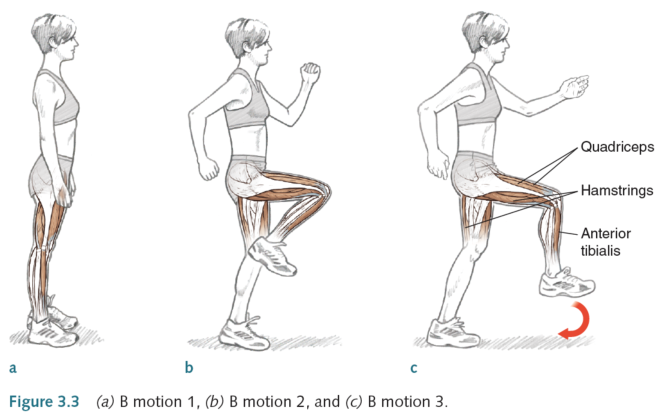 Essentially, the drills, commonly referred to as the ABCs of running, isolate the phases of the gait cycle: knee lift, upper leg motion, and pushoff. By isolating each phase and slowing the movement, the drills, when properly performed, aid the runner’s kinesthetic sense, promote neuromuscular response, and emphasize strength development. A properly performed drill should lead to proper running form because the former becomes the latter, just at a faster velocity. Originally these drills were designed for sprinters, but they can be used by all runners. Drills should be performed once or twice a week and can be completed in 15 minutes. Focus on proper form. 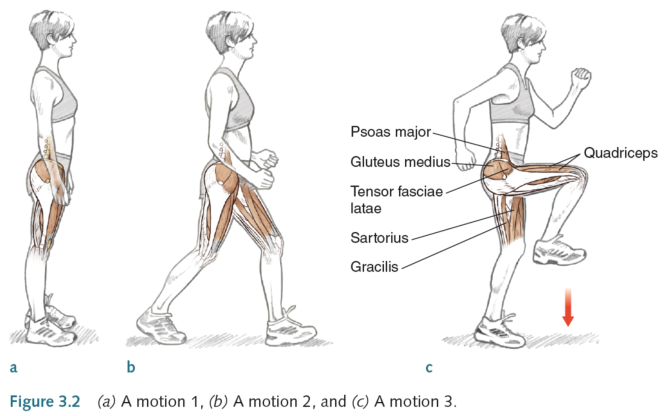 The A motion (figure 3.2; the movement can be performed while walking or more dynamically as the A skip or A run) is propelled by the hip flexors and quadriceps. Knee flexion occurs, and the pelvis is rotated forward. The arm carriage is simple and used to balance the action of the lower body as opposed to propelling it. The arm opposite to the raised leg is bent 90 degrees at the elbow, and it swings forward and back like a pendulum, the shoulder joint acting as a fulcrum. The opposite arm is also moving simultaneously in the opposite direction. Both hands should be held loosely at the wrist joints and should not be raised above shoulder level. The emphasis is on driving down the swing leg, which initiates the knee lift of the other leg. 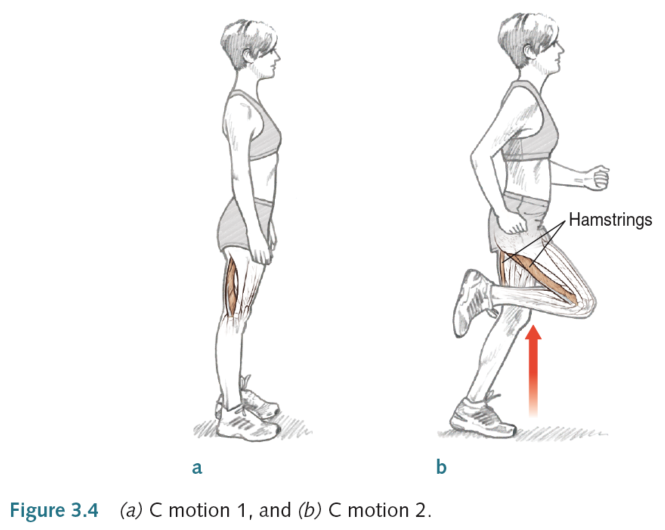 The B motion (figure 3.3) is dependent on the quadriceps to extend the leg and the hamstrings to drive the leg groundward, preparing for the impact phase. 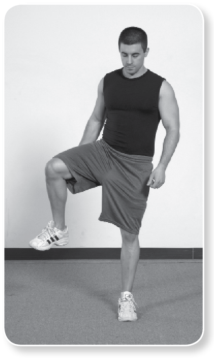 In order, the quadriceps extend the leg from the position of the A motion to potential full extension, and then the hamstrings group acts to forcefully drive the lower leg and foot to the ground. During running the tibialis anterior dorsiflexes the ankle, which positions the foot for the appropriate heel landing; however, while performing the B motion, dorsiflexion should be minimized so that the foot lands closer to midstance. This allows for less impact solely on the heel, and because the biomechanics of the foot are not involved as in running, it does not promote any forefoot injuries. Swimming anatomy is quickly becoming a top seller for those wanting to learn more in depth about their swimming. Here’s a podcast by the author of from Swimming Anatomy. It’s published with permission of Human Kinetics. This is a good audio interview of Dave Scott and Jason Ash. Enjoy. One interesting note is that Dave Scott advocates working injury prevention into your program.